Why pay more for the same brand. We can help. Reserve your car today. 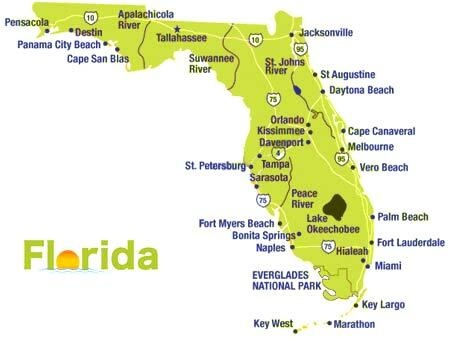 Our newly expanded rental car network encompasses the entire State of Florida with numerous airport locations. This includes the many Florida travel destinations that so many have come to love. From beaches and amusement parks to large metro areas, Florida has it all and throughout the year, including Winter. Learn more about some of the most popular spots in Florida. Discover the seven regions that Florida is comprised of: The Panhandle, The Northeast, The Gulf Coast, Orlando and the Space Coast, The Gold and Treasure Coasts, The Everglades and The Keys, and Miami. Let us provide you with a rental car for your Florida transportation needs. 2007-2019 Florida Sun Car Rentals - Discounted SUV's, Vans, Convertibles and Luxury Autos. Florida rental cars for Orlando, Miami, Ft. Lauderdale, The Keys and more. Book now, pay later.